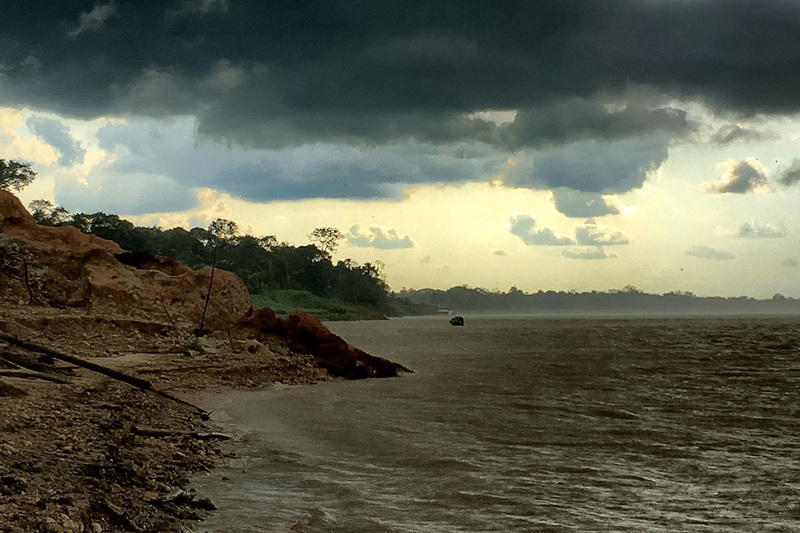 An afternoon storm passes over the riverbanks we were examining, halting field work for a while. What are Julia, Vanessa and Jim doing in the Amazon? Read their first blog post to find out! I come downstairs, and our Brazilian lead scientist, Renato, is the first to say “Bom día,” “Good morning.” Everyone else chimes in from around a table filled with fruits, breads and coffee. 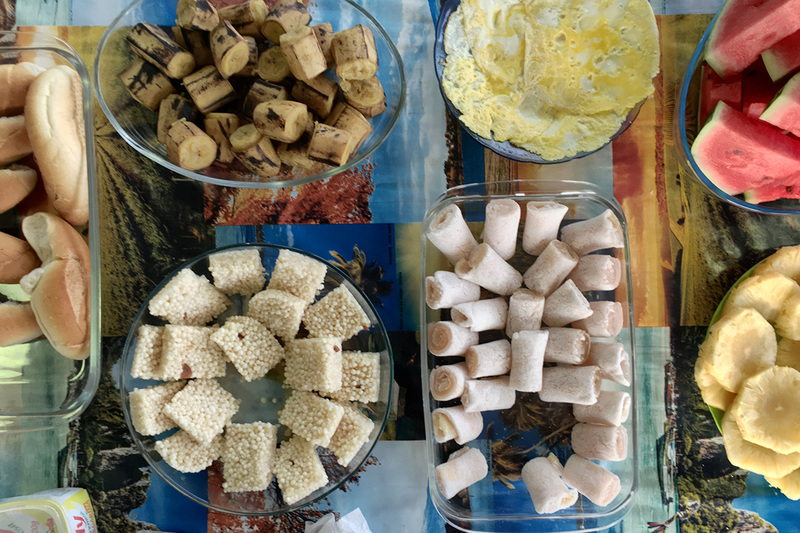 Breakfast fare: bread, fried banana, rice cakes, eggs, manioc rolls, melon and pineapple. Soon, we all begin grabbing water bottles and putting on boots and sunscreen so we waste no time getting onshore. We pile into a smaller boat, supplies in tote, in order to reach our first site on the riverbank. 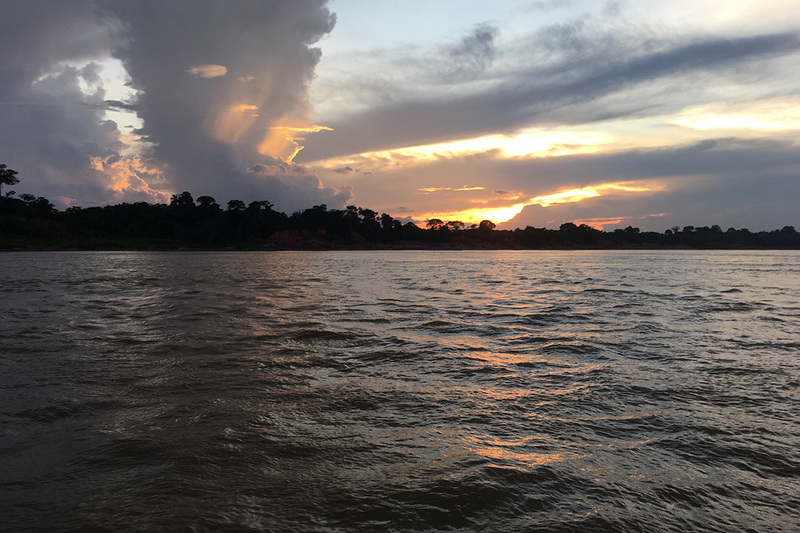 This time, the boat ride is longer than usual because we want to travel to a part of the river that is upstream from where we docked. We are in search of ancient deposits of the Solimões River that can tell us what the river was like in the distant past. 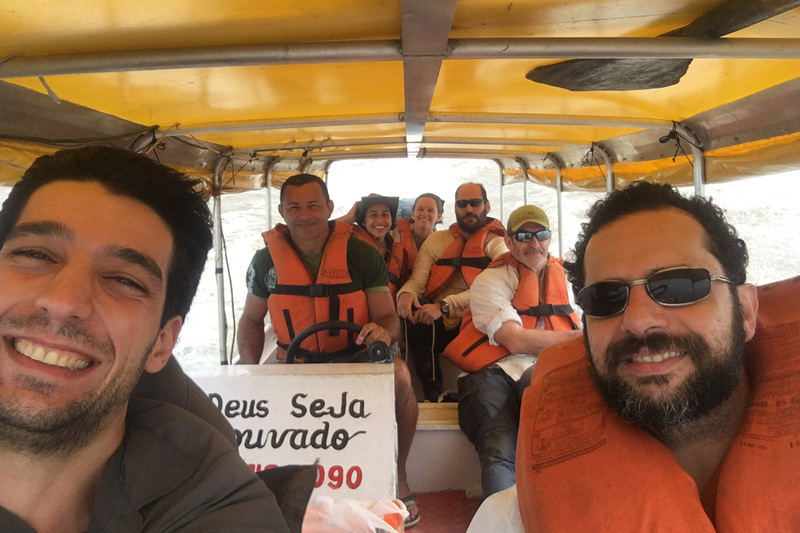 The field team snaps a selfie while travelling on our small field boat to the riverbank. Cristiano gets stuck in the mud after stepping out of the boat. 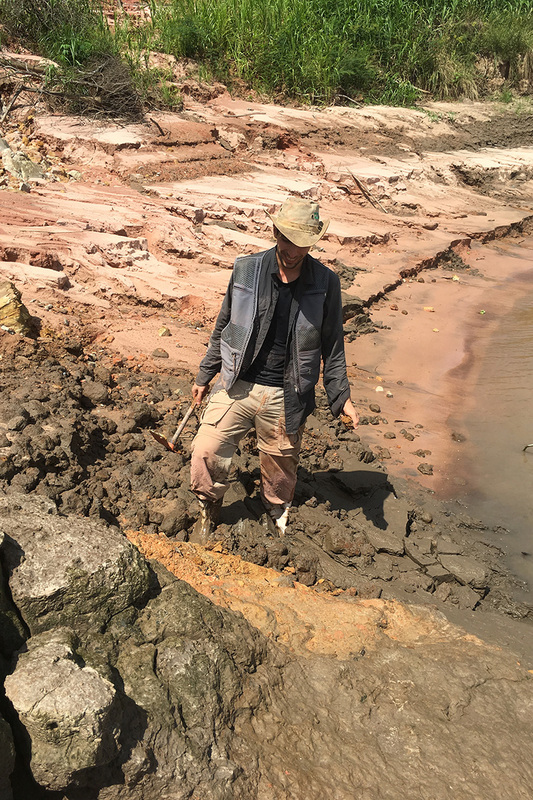 When we approach the shore, Brazilian grad student Cristiano is the first to step onto land and sinks deep into the muddy layer. We then all follow, but step out of the boat carefully and quickly to avoid the same muddy fate. Vanessa and Jim are the first to the sediment cliffs. They take in the stunning view of the river, with the early morning sun reflecting off the water surface and shining golden rays onto the cliff face. 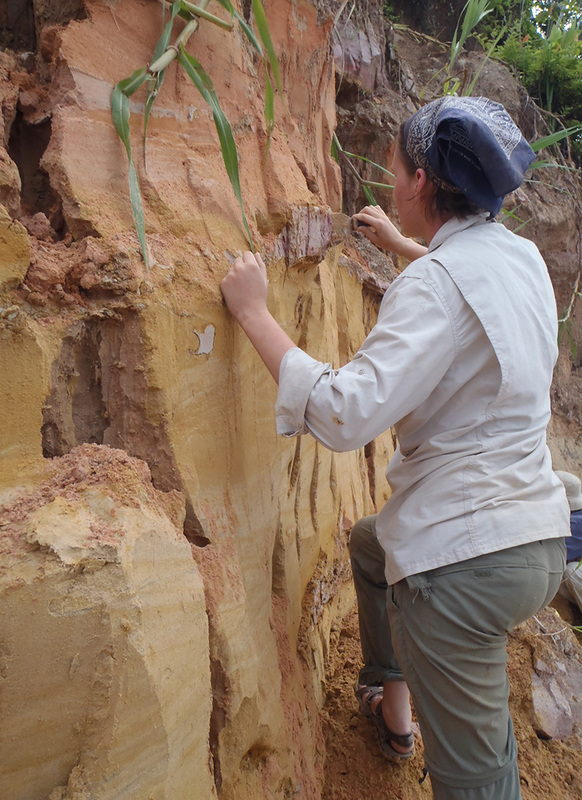 Vanessa scrapes off the surface of a cliff exposure to reveal its ancient sedimentary features. 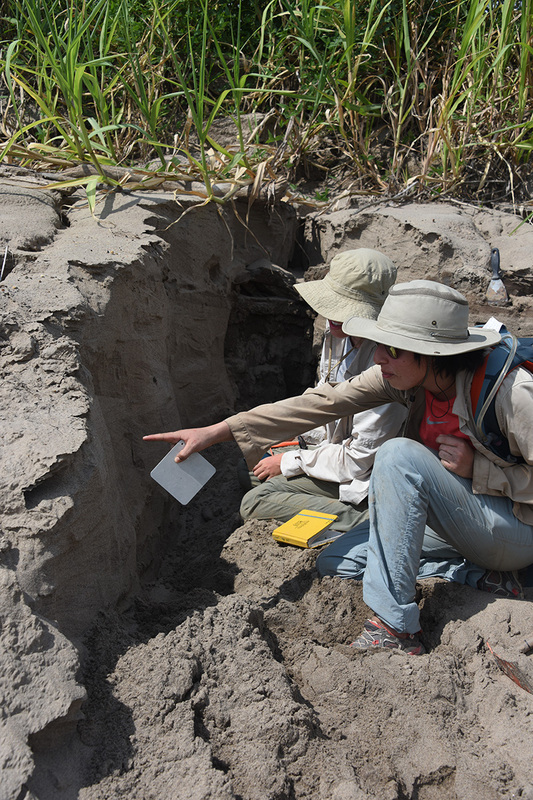 Vanessa then starts scraping away at the soft sand and mud with her trowel, to begin revealing its ancient history. 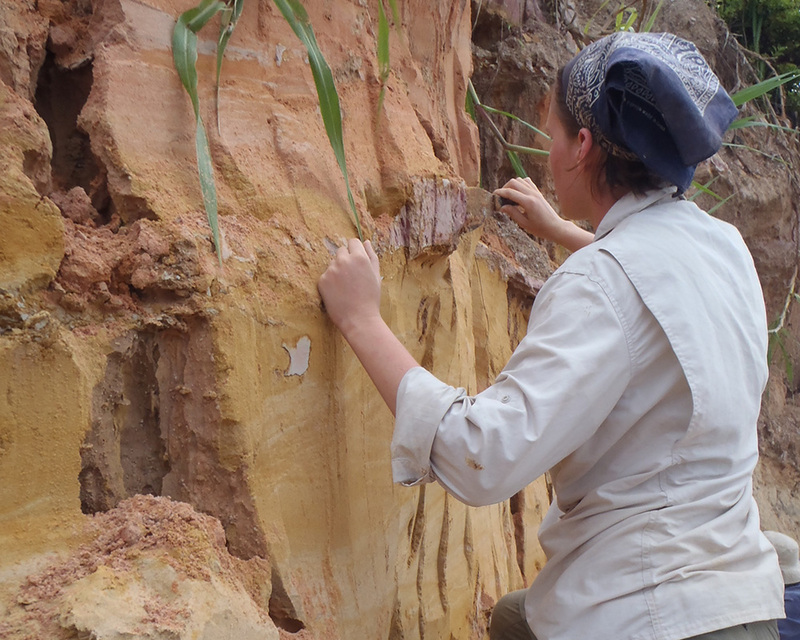 We’re studying the geological makeup of the deposits and quantifying which way the paleo-Solimões flowed, in order to build a picture of how the Amazon’s rivers have changed over time. 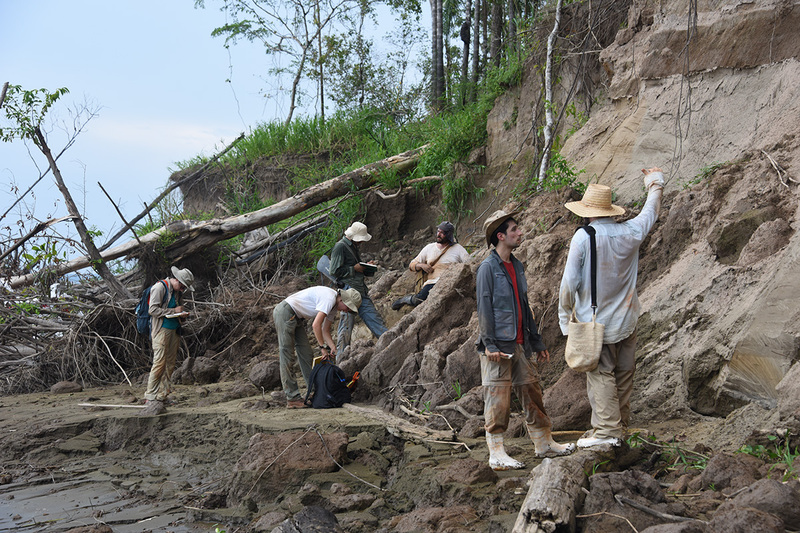 The field team takes notes and discusses the ancient deposits of the Solimões River. It’s painstaking work, as the river is huge and the temperature is 95 degrees Fahrenheit with high humidity. But slowly, the deposits are uncovered, and with each scrape of each new riverbank, more of this remarkable story unfolds on the ancient deposits of the world’s mightiest river. A storm rolls in over the last sunset of the field campaign.